CIVIL PROTECTION volunteers were pressed into action after a coach slid off the road and became wedged hard against a crash barrier this morning. The accident happened near the town of El Burgo in Malaga province, which sits in the Sierra de la Nieves Natural Park. Because the vehicle’s door was firmly stuck against the guardrail passengers were safely removed by means of the driver’s window. 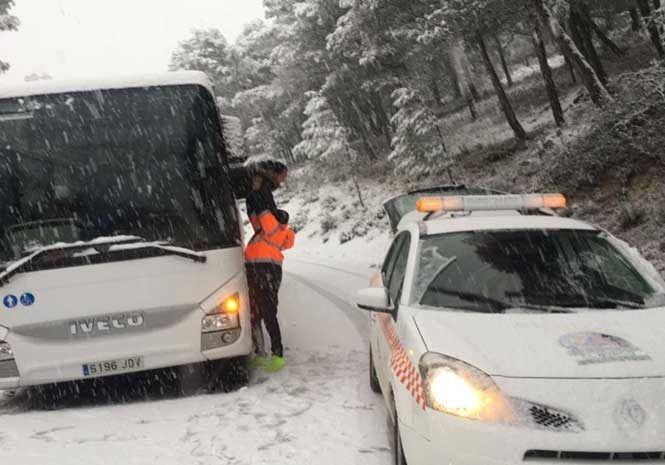 The area, and the wider Serrania de Ronda, in southern Andalucia, has suffered an intense snowfall woke to a blanket of snow this morning but highway crews have been working around the clock to keep roads open.